The play reveals to the very depths the character of Blanche du Bois, a woman whose life has been undermined by her romantic illusions, which lead her to reject – so far as possible – the realities of life with which she is faced and which she consistently ignores. The pressure brought to bear upon her by her sister, with whom she goes to live in New Orleans, intensified by the earthy and extremely “normal” young husband of the latter, leads to a revelation of her tragic self-delusion and, in the end, to madness. A play of poetic power and deep, compassionate understanding, it tells the story of a beautiful woman whose life is undermined by fantasy and the memory of a tragic love, combined with the resentment and passion she instills in her brother-in-law. 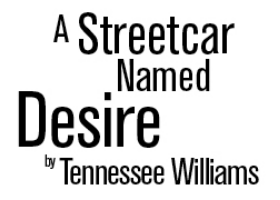 A modern classic, A STREETCAR NAMED DESIRE, won all the major American theatre prizes from The Drama Critics Circle Award to The Pulitzer Prize. Produced as a play and published in book form around the world and made into an Academy Award winning motion picture that introduced a new era of filmmaking, as well as other film and television versions. "Nobody sees anybody truly but all through the flaws of their own egos. That is the way we all see each other in life," Tennessee Williams says about "A Streetcar Named Desire" in Kazan's 1988 autobiography "A Life;" and in a letter opposing the movie's censoring before its release he described the story as being about "ravishment of the tender, the sensitive, the delicate, by the savage and brutal forces of modern society."